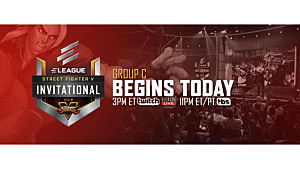 Over the past two weeks, ELEAGUE's Street Fighter V Invitational has turned out to be a phenomenal and continuously surprising tournament. In last week’s Group A bouts, we saw a reigning EVO champ in Takido, as well as a tenacious Group A underdog in Dogura, make it to the playoffs. It was a night full of comebacks and shocking twists. Friday’s Group B matches provided more of the same. Moving out of round-robin play and into the bracket finals, Punk, Phenom, Momochi, and Commander Jesse were the four contenders left standing. In an almost perfect mirror of Group A's standings, Momochi went winless in round-robin play but ignited going into bracket play to defeat both 801Strider and Fuudo in the first two matches of the lower bracket. 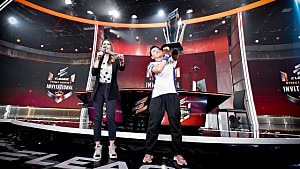 What’s more, Jesse "Commander Jesse" Espinoza, a contestant on ELEAGUE's The Challenger: Street Fighter V found himself in the Top 3 entering bracket play -- much like Jonathan "JB" Bautista did the week before in the Group A round. However, the primary storyline going into the night was the rematch between Punk and Phenom. Earlier in the afternoon, the two world warriors had faced off in the very first match of round-robin play. There, Punk bested Phenom just as he had in ELEAGUE’s 2017 finals — Phenom even had a similar nightmare drop. So going into the bracket finals, both analysts and fans alike desperately wanted to know if Phenom had truly gotten over “the drop heard around the world” -- and if he would get one more shot at Punk. Everyone would soon know the answer, but Phenom first had to get past Commander Jesse. 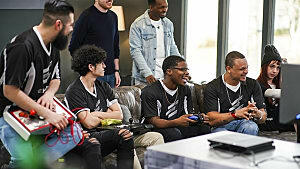 Ahead of the match, the atmosphere inside the ELEAGUE studios was tense — especially between Phenom and Jesse. Both were hyper-focused, dedicated to moving on to the impending match against Punk. Jesse told the audience he was just happy to be on such a great stage, but the look in his eyes said otherwise: he wanted to take down Phenom, too. The first game of the match started off clean for Phenom as he landed early heavy attacks to put Jesse into stun. A quick commando throw from Phenom took Jess down and secured Phenom's first-round victory in only 19 seconds. Although it wasn’t looking good for Jesse going into the second round of the first match, Jesse buckled down and set into focus. More composed, Jesse played very defensively and stretched out the second round. Both fighters went down to (crazy) low health, with Jesse pulling off the round victory with 39 seconds left on the clock. However, it was one of the rare highlights for Jesse in the game. With Phenom up on Jesse 2-0, the third match of the game set the stakes high for Jess. Despite his every counter and adjustment, Jesse simply couldn’t get a consistent bead on Phenom. Not only was the concern palpable from the audience — it was written on Jesse’s face as the fighting resumed. Turning into a huge offensive battle between both players, Jesse pushed and brought Phenom to the brink in an excellent show of patience and poise, stealing another round from Phenom. But Jesse’s success would be short-lived. In the subsequent rounds, Phenom came out swinging, pulling off punishing command throws and completing clean jump-ins. In what proved far too much for Jesse’s Dhalsim, Phenom was able to cover incredible distance and activate clutch v-triggers to win the game 3-0 and advance to face his arch nemesis Punk. Jesse would move down to the “loser’s” bracket to face Momochi. Despite the veritable battle he had just fought against one of the best Street Fighter V players in the world, Jesse’s next loser-goes-home matchup would be one of his hardest of the night … and perhaps his last. Momochi had already proven a powerful bracket competitor by defeating 801Strider and Fuudo in the first two matches of the lower bracket. And that was after he had gone 0-5 in round-robin play. However, based on matches between the two earlier in the day, Jesse had gotten the best of Momochi, so it was anybody’s game going into the first round. Just as the game between Phenom and Jesse had started off slow, so did the first match between Momochi and Jesse. Each player played neutral, attacking intermittently to test the other before jumping in with bigger prods. Ultimately, it was Jesse who gained first damage and a win in the first match. However, the confident look on Jesse’s face would soon fade. Despite the fantastically patient play from Jesse, Momochi’s Kolin played very aggressively, mauling Jesse for huge multi-hit combos. In the second match of the game, Jesse pulled off some incredible normals, specials, and throws, but got slammed into the corner after badly faltering. Where he was able to weather Momochi in the first match, Jesse dropped both rounds of the second. With the bout tied 1-1, it was obvious that Momochi had flipped a switch as he stared across the stage into the very fabric of Jesse’s soul. From then on, Jesse had rounds where he showed echoes of his former brilliance, but nothing he did could stop the onslaught that was Momochi. At times, Jesse looked petrified, locked in place by Momochi’s viciously relentless attacks. In the third game, Momochi landed multiple consecutive throws to go up 2-1 in the game. Things only got horribly worse for Jesse. In the following match, Momochi straight bodied Jess in the first round. And although Jesse fought back valiantly, taking Momochi down to a tic of health, it was too little too late for the Southern California hero. Jesse lost 3-1 -- and Momochi put himself in position to make it to the playoffs. This was the match everyone had been waiting for. Going in, Punk talked a ton of smack to Phenom, letting him know that he wasn’t going to be bested — no matter what his opponent threw at him. Phenom took it in stride, but from his body language, it looked as if Punk’s pre-match smack talk had (perhaps) gotten under his skin. Phenom started the game aggressively, pummeling Punk with normals and specials, interspersing a few throws for good measure. Phenom pulled great v-triggers, too, defeating Punk in first round. Into the second round, Phenom once again started strong, quickly putting Punk in the corner. As Punk missed a crucial anti-air, Phenom jumped in again, pummeling Punk to gain screen advantage. But as the first match wore on, Punk leveled the playing field with a clutch critical art and disciplined, yet terrifyingly powerful normals to come out on top 1-0 in the match. Despite Phenom’s aggressive play throughout the next two matches, masterful blocking and defensive play from Punk kept the Norwegian player from connecting just about anything consequential at all. In the second match, Phenom struggled to connect anything early, with Punk utterly devastating him in all aspects of the game. And although Phenom started to come back in the later rounds, Punk firmly put him in his place with a completely dominating Match 2 performance -- and one that would inform the rest of the game. I don't really care about many opponents. I just care about the one that I play next and that's the only guy that I feel like has haunted me -- and he's the only guy I have to beat to regain everything. And that's Tokido. I just want Tokido to know that I'm coming for him next time and it will not be as free as last time. When these two fighters had faced each other earlier in the day, Phenom had completely disrespected Momochi with four consecutive throws and a savage win. The crowd was ready to see if Momochi would finish his Dogura-esque lower bracket run and redeem himself against Phenom or cave under the pressure of securing so many consecutive high-profile wins. The winner would go on to fight Dogura in the playoffs. As the first match of the game began, both fighters started fierce. Both immediately jumped in each other’s faces, trading normals and specials to come even in health. The intense fighting eventually subsided into more cautious approaches by both players, with each only unleashing in short spurts of violence. Momochi secured the first round, and the second began more freely than the first, with both Momochi and Phenom trading places in the right corner — and trading rounds. 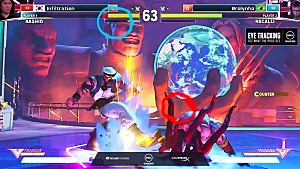 As Kolin neared, stun in round three, Momochi pushed Phenom across the stage and the two played in the neutral before erupting into a hail of attacks from both sides. Ultimately, Momochi won the first match to go up 1-0 in the game. As the game wore on, Momochi continued to bring vicious, unrelenting attacks to bear, mixing in unbelievable range to wreak havoc on Phenom. Two devastating multi-hit combos sealed the first round of the second match for Momochi as Phenom's attacks couldn't seem to find their targets. Going into the third match, a seemingly desperate Phenom switched from Necalli to Guile, hoping to force Momochi into a new strategy. Alas, the character change didn't change the tenacity and ferocity of Momochi’s play. The one-sided match played out completely Momochi's favor. Phenom went home, and Momochi spectacularly won four straight 3 out of 5 games to advance to the playoffs against Dogura. 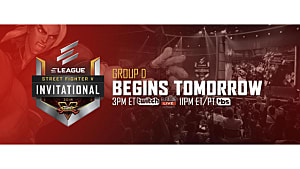 ELEAGUE'S Street Fighter V Invitational is a five-week competition that pits some of the world's best Street Fighter pros against each other for $250,000 in prizes. Next week, Group C takes the stage. 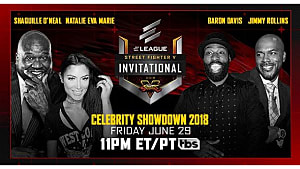 You can watch the matches on ELEAGUE's Twitch channel, as well as TBS, each Friday through June. Stay tuned to GameSkinny for more coverage of the tournament, as well as Street Fighter V, as it develops.